Straight talk on turbulence, pilot training, and safety. 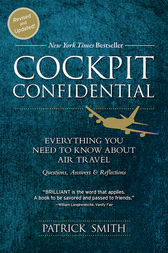 COCKPIT CONFIDENTIAL covers not only the nuts and bolts of flying, but the grand theater of air travel, from airport architecture to inflight service to the excitement of travel abroad. It's a thoughtful, funny, at times deeply personal look into the strange and misunderstood world of commercial flying. "Anyone remotely afraid of flying should read this book, as should anyone who appreciates good writing and great information." —The New York Times, on ASK THE PILOT.